As anyone who knows me well will tell you, I make some mean deviled eggs. It would be pretty hard to improve upon my deviled eggs. Or, at least that's what I'd believed up until just a few minutes ago. Coming as a blessing that feels more like a curse, every single egg in this carton of Jumbo Grade A Jersey Lynne Farms White Eggs contains two yolks. That's 12 eggs, 24 yolks. A nightmare of cholesterol, if that's something you care about. More yolk means more egg to be deviled. So, now I'm eating these amazing deviled eggs and feeling weirdly circumspect about each bite. I mean, what kind of barnyard engineering does it take to get a hen laying strictly twin-yolked eggs? What kind of sorcery? Some preliminary googling tells me that: a) this is not uncommon for those who live on a farm to see b) then hen who laid these may have been young and reproductively unsynchronized ;( c) I've met the minimum criteria to be featured in a news piece by my favorite Paper of Record, The Daily Mail! d) this is an omen of death e) someone in my family is pregnant. 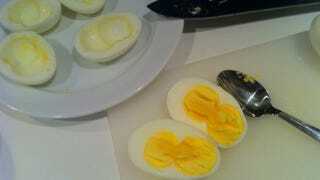 Apparently, the chance of just a single egg coming out with double yolks is 1 in 1000. My friend Anna told me over gchat just now, I've "messed with something deep." Horrors. Nothing fancy, but if you don't believe me when I tell you they are the best deviled eggs, just ask my friends.